LONG RANGE ✪ An impressive 2 mile range and 3 channels enable long distance play and open a world of possibilities within your child's outdoor adventures! LOADED WITH FEATURES ✪ A bright LCD display, call alert function, and built-in flashlight plus belt clip will make kids feel like true agents on a mission! CRYSTAL CLEAR SOUND ✪ No more mumbo jumbo! With a developed clear voice technology, your child's voice will be crystallized to perfection. Other brands do not have this CRYSTAL CLEAR SOUND! CHILD FRIENDLY DESIGN ✪ These will fit comfortably in children's hands with our special ergonomic design. An uncomplicated push-to-talk button makes this toy easy to use for all ages! 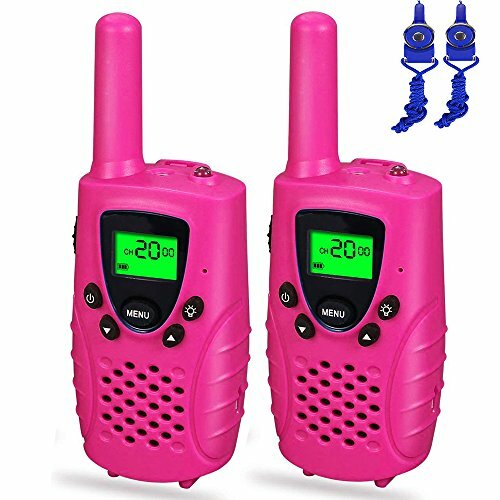 BEST QUALITY ✪ With a super durable yet lightweight build, these walkie talkies are easy to carry around while resisting wear and tear to provide kids with endless entertainment! If you have any questions about this product by Dable, contact us by completing and submitting the form below. If you are looking for a specif part number, please include it with your message.